I love love LOVE the beautiful greenery here in the Pacific Northwest, but the constant rain and gloomy weather can get me down a lot. I can't even walk my dog without having to either give her a bath every time or endure muddy paw prints all over the house. Since everything seems so dull and gray outside, I've started working on some pattern collections in fun and bright colors. I'm never one to shy away from vibrant colors in my designs, but I really feel like I need them lately. This first collection was inspired by a ski trip we took this past weekend to Mt. Hood here in Oregon. I had never been skiing before, and know I have much more admiration for pro skiers and snowboarders. It wasn't easy at all! (And my shins are still sore.) We had a lot of fun, though, and I wanted to create a collection centered around a ski lodge. 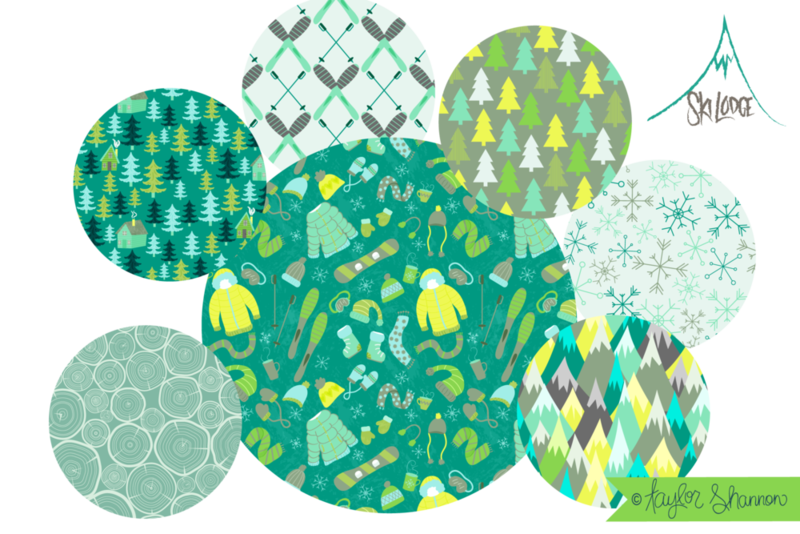 I'll also be entering in the Printed Village Ski Lodge challenge, so feel free to check out my designs there! These bright colors are getting me through this dull weather these days. Hopefully sunny days are coming soon!